This months sees the much anticipated release of the Space Marines from Games Workshop, their biggest and most successful range. So if you have not seen the pictures of their new goodies, then where have you been as they have definitely caused a stir. This will be Games Workshops biggest release since the release of the Brand New sixth addition rule book earlier this year. Make sure you check out our Web-store @ www.4tk.co.uk or even pop into our store to check out our deals. If your in time make sure you get your Pre order in for a standards 20% discount or 25% discount if you are or subscribe to our news letter . Make sure you make the most out of the deals and offer we do by signing up to our news letter. By signing up you will make sure you keep up to date with everything we are doing from our latest promotions to whats happening in our club a long with the latest Tournament updates. We will in most cases only send out 1 mail out per week but on the odd occasion possibly two. If you subscribe and its not for you then it is very easy to unsubscribe. For years now we have been running a very poor club website that did not offer very much and was pretty poor yo navigate and for the people that have used it we are sorry. Hopefully though this new website although is still work in progress offers much more and is much simpler to get the information you need. We have done a lot of work to make sure it really reflects what 4Tk Gaming is all about. If you have any comments, good or bad then please let us know. 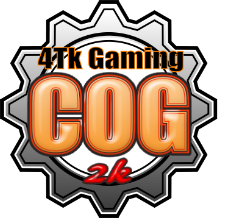 As well as an all new look we have tried to let you know what we are all about, what services we offer, how we are different to our web-store as well as and most importantly what the 4Tk Gaming Club is up to in regards to gaming events, tournaments and members. The next steps for this website is to focus on increasing our Tournament offering to include Dreadball, Dropzone, Infinity, Dystopian Wars and Firstorm Armarda. You will also see shortly in the tournament section galleries of past Events and Tournaments that we have put on. As you may be aware if you have come down to visit over the last year that we have had a lot going on. Well Finally the store is almost there, we are just waiting for our final lot of fixtures and then we can start to take it a little easier. It does not how ever mean that we are finished, we have so much more that we want to do. 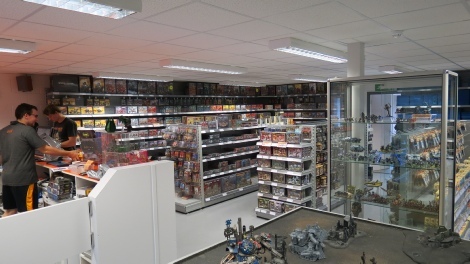 In the near future you can look forward to some purpose built demo table being installed so we can teach you how to play at least 4 of our core gaming systems, which will be 40k, Warmachine & Hordes, Dropzone and Infinity. Also coming this year will be the introduction of Star Trek, Valejio Air and an expansion to our hobby supplies range. Garath and Dave are our X-Wing experts and know the game almost inside out although I have seen them play. Great guys and really easy to talk to.